My kids started school this week and they are quick to tell anyone who will listen that “their summer" is OVER! I, on the other hand, cannot help but think summer is actually at its peak when it comes to home grown veggies. We have been eating fresh-picked tomatoes, corn and cucumbers every meal and each night I swear it is the best tasting produce of the season! Homegrown just keeps getting better and better . . . I have been experimenting with some new salads and this one called Creamy Cucumber Salad with Bacon and Apple is a keeper for sure! I love the snappiness of a fresh picked cucumber, grated apple also makes an appearance and bacon assures this recipe will be a homerun hands down! The resulting salad has nice crunch from the cucumbers, a hint of sweetness from the apple, smokiness from the bacon and a little zing from the vinegar soaked onions. All around yum! If you are looking for a delicious way to enjoy the fresh flavors of summer, give this recipe a try! Peel cucumbers, half lengthwise, remove seeds and slice about ¼-inch thick (should yield 4 cups). Place cucumber slices in a single layer on paper towel-lined baking sheet. Refrigerate for 20 minutes. Then blot cucumbers dry with paper towels. In a 2-cup bowl, mix onions and vinegar; allow to sit at room temperature 20 minutes. Place bacon in a cold 12 to 14-inch skillet. Cook over medium heat until crisp about 5 to 7 minutes. Place bacon on paper towel-lined plate to cool; then crumble. Whisk dressing ingredients together in a large serving bowl. Set aside for 4 to 5 minutes. Taste and adjust for seasoning. Add grated apple and toss well. 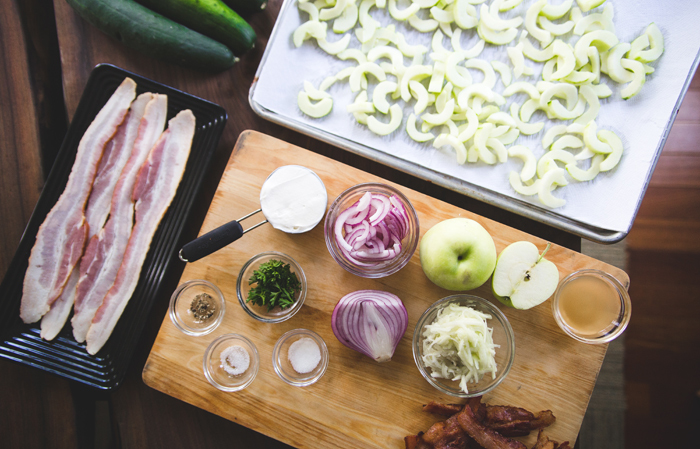 Add cucumbers, onion-vinegar mixture and crumbled bacon to the dressing. Toss to combine. Allow to set about 10 minutes. Taste for flavor, adjusting with salt and pepper if needed. Makes 4 to 6 servings. Salad can be made 24 hours in advance.